The only useful purpose of the present birth is to turn within and realize the Self. The Self itself is god. Eventually, all that one has learnt will have to be forgotten. I want you to dive consciously into the Self, into the Heart. If one watches whence the notion of ‘I’ springs, the mind will get absorbed into that. There is no greater mystery than this: being Reality ourselves, we seek to gain Reality. If one has form oneself, the world and God also will appear to have form. But if one is formless, who is that sees those forms, and how? Without the eye can any object be seen? The seeing self is the eye, and that eye is the eye of infinity. Heart is merely another name for the supreme spirit, because he is in all hearts. The entire universe condensed in the body, and the entire body in the heart. I cannot show you God or enable you to see God because God is not an object that can be seen. God is the subject. He is the seer. Don't concern yourself with objects that can be seen. Find out who the seer is… You alone are God. Time is only an idea. There is only the Reality Whatever you think it is, it looks like that. If you call it time, it is time. If you call it existence, it is existence, and so on. After calling it time, you divide it into days and nights, months, years, hours, minutes, etc. Time is immaterial for the Path of Knowledge. But some of these rules and discipline are good for beginners. The shock of the fear of death drove my mind inwards and I said to myself mentally, without actually framing the words: ‘Now death has come; what does it mean? What is it that is dying? This body dies.’ And I at once dramatized the occurrence of death. I lay with my limbs stretched out stiff as though rigor mortis had set in and imitated a corpse so as to give greater reality to the enquiry. I held my breath and kept my lips tightly closed so that no sound could escape, so that neither the word ‘I’ or any other word could be uttered, ‘Well then,’ I said to myself, ‘this body is dead. It will be carried stiff to the burning ground and there burnt and reduced to ashes. But with the death of this body am I dead? Is the body ‘I’? It is silent and inert but I feel the full force of my personality and even the voice of the ‘I’ within me, apart from it. So I am Spirit transcending the body. The body dies but the Spirit that transcends it cannot be touched by death. This means I am the deathless Spirit. 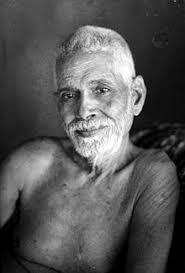 Ramana Maharshi was a Indian spiritual sage, guru and mystic. He is best known for his spiritual pointings, his graceful eyes and his timeless wisdom shared with the world.